Solar radiation at Earth's surface is typically defined as total radiation across a wavelength range of 280 to 4000 nm (shortwave radiation). Total solar radiation, direct beam and diffuse, incident on a horizontal surface is defined as global shortwave radiation, or shortwave irradiance (incident radiant flux), and is expressed in Watts per square meter (W m-2). Pyranometers are sensors that measure global shortwave radiation. Apogee Instruments offers both silicon-cell and black-body thermopile pyranometers. Silicon-cell pyranometers are only sensitive to a portion of the solar spectrum, approximately 360 to 1100 nm (approximately 80 % of total shortwave radiation is within this range). The cosine response and accuracy of the Apogee pyranometer have met the high standards of Campbell, Scientific, on of the world's leader in environmental measurements. Campbell Scientific installs Apogee Pyranometers on weather stations such as the ET106 and other data collection systems. Colombia Weather Systems incorporates Apogee's silicon-cell pyranometer in all of their weather station configurations requiring solar radiation. 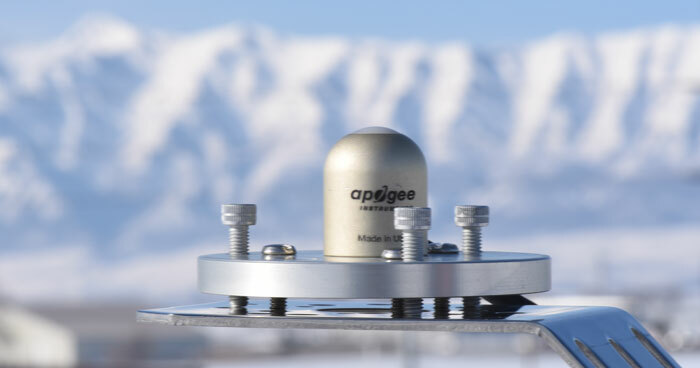 WeatherHawk weather stations feature Apogee pyranometers for measuring solar radiation. The pyranometer's ruggedness and durability make it ideal for continuous outdoor use, while home users welcome its affordability.